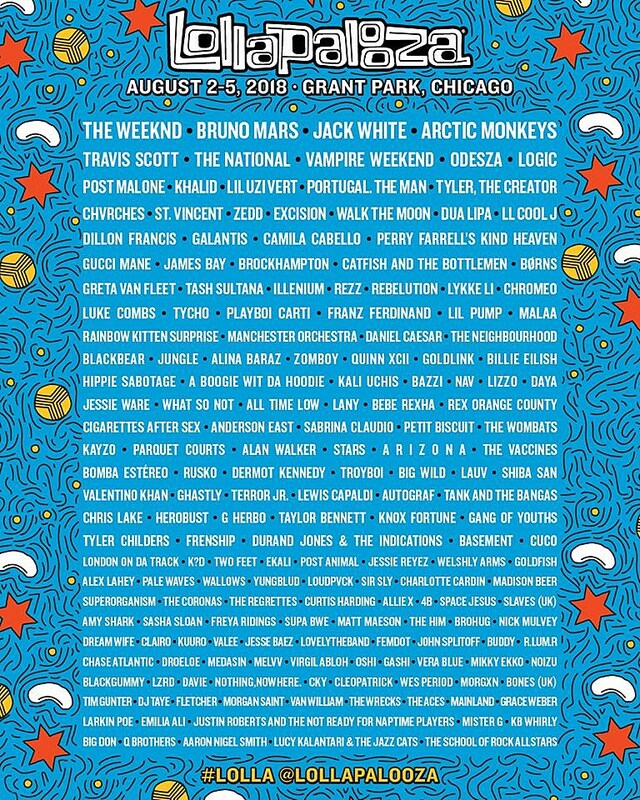 Lollapalooza 2018 happens August 2-5 in Chicago’s Grant Park, and the lineup includes The Weeknd, Bruno Mars, Jack White, Arctic Monkeys, Travis Scott, The National, Vampire Weekend, ODESZA, Logic, Post Malone, Khalid, Lil Uzi Vert, Portugal. The Man, Tyler the Creator, CHVRCHES, St. Vincent, LL Cool J, Camila Cabello, Perry Farrell’s Kind Heaven, Gucci Mane, Brockhampton, Lykke Li, Tycho, Franz Ferdinand, Manchester Orchestra, Goldlink, A Boogie Wit Da Hoodie, Kali Uchis, Lizzo, Jessie Ware, Parquet Courts, Stars, G Herbo, Gang of Youths, Tyler Childers, Basement, Alex Lahey, and more. Full lineup below.